Camping and sleep… Say what?! Nine ways to get great sleep while camping with the family this summer! The first long weekend of the summer is almost upon us! With it, for many, comes the first of many family camping trips of the season. 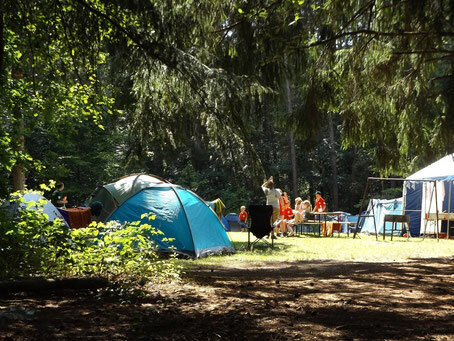 My clients seem to love the great outdoors, because I get a lot of questions about camping, and how to keep sleep on track while enjoying family camping trips. Here are my top tips when it comes to the camping-sleep combo! Arrive at your campsite early in the day. This will give you time to set up so that you can have your child in bed at an appropriate time and he doesn’t start the trip overtired. Mimic your child’s home sleep environment, as much as possible. Bring your child’s comfort object, pillow (if he uses one), and his favourite blanket or sleep bag. Pack weather-appropriate sleepwear, and be prepared for sudden changes (stiflingly hot nap days, or very chilly nights!). If your child is still wearing a sleep bag, remember that these come in many different thicknesses for many different temperatures and comfort levels! Take a sound machine, even if you don’t generally use one at home. Late-night campers making lots of noise, and the early-morning chirping of the birds can wreak havoc on your little one’s rest. Make sure your sound machine takes batteries and that it doesn’t automatically shut off after an hour or two. This is one of my favourite sound machines! (You can also use a white noise app on your phone or other smart device). Stick with Naps: naps can be tough while camping. Your child is having fun and won’t want to take a break. But it’s important to get that nap in so your child doesn’t become over tired. It may take him a little longer to fall asleep, but it will avoid overstimulation and make him less irritable, which means more fun for the whole family! Depending on your camping device (tent, trailer, etc.) and setup, a portable blackout blind may help reduce bright light and make naps and early evenings easier. Keep busy bodies full of nutrients: Keep your little one fueled with nutrient-dense food so he isn’t hungry in the middle of the night and waking early to eat. Think whole grains and protein! Get prepared for the night before bedtime starts: For example, if you’re camping with a little one who still take a bottle, get the bedtime bottle prepared in advance so you’re not doing it in the dark! Also be sure to get PJs, blankets, favourite stuffies, etc. all ready by the bed so there is no scrambling in the dark to find these things when it's time to hit the hay. Bedtime: Consistency is king, as always, when it comes to sleep. So, continue with your regular routine. You may not have access to a bath, but a wash down with a cloth, PJs, books/songs and cuddles are all things you can bring with you. If nap-time was a fail, bump bedtime up accordingly. Relax! Summer short - enjoy it! You have a fantastic little sleeper; anything that goes off-track for one weekend can be adjusted as soon as you get back to your regular routine at home. Erin Junker is a Professional Infant & Toddler Sleep Consultant, and owner of The Happy Sleep Company (thehappysleepcompany.ca). She works closely with tired parents to help them help their little ones get the healthy, restful sleep they need. 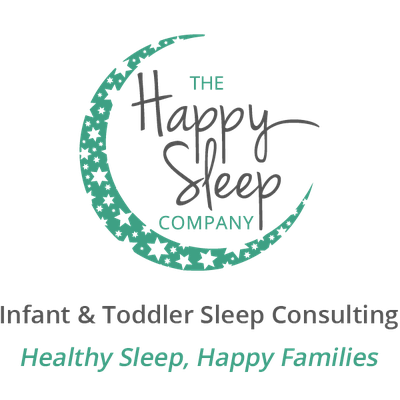 Follow her at www.facebook.com/thehappysleepcompany and on Twitter @TheHappySleepCo, and let’s get your family the healthy, happy sleep you deserve!